When you are looking at replacing your old garage door, or perhaps looking to install a new garage door for your newly built home, you will want to know the common garage door sizes available. Action Garage Door has compiled the most common garage door sizes for you! If your needs are not met by a standard garage door size, remember that there are always custom garage door options available! 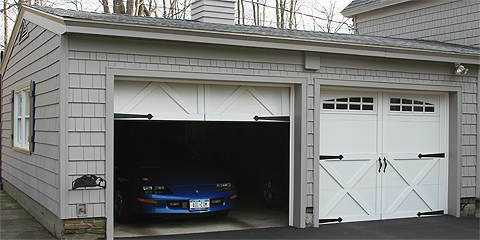 One of the most common sizes for residential garage doors is a single garage door. These have a measurement of 10 x 7 feet, 9 x 7 feet and 8 x 7 feet. These sizes are ideal for standard homes that want to put their standard vehicles in their garage. These garage doors are not ideal if you have a larger than average vehicle or an RV, bobtail, or large amount of storage. If you feel that your requirements may grow with time, you may want to consider a double garage door. These garage doors accommodate large vehicles and work trucks. The typical garage door sizes have measurements of 16 x 7 feet, 14 x 7 feet, and 12 x 7 feet. Different lengths may be offered by different manufacturers. If you have a question on if a double garage door may work for you, contact your garage door technician. They would be able to help you. Commercial garage door sizes can vary depending on the use and location of the garage door. The standard is typically a width of 32 feet x 2 inches and a height of 24 feet x 1 inch. Many businesses opt for custom doors due to the specific nature of their business and the requirements they have. If you have questions about specific garage door sizes, contact Action Garage Door today at (877) 392-2590. We would be happy to assist you.